History has repeatedly shown that scholars and art-lovers (no matter how distinguished and mild-mannered) who put themselves between museum picture restorers and their professional ambitions, run high risks. In 1950 Ernst Gombrich drew attention, in a Burlington Magazine letter, to Pliny’s description of wondrous effects achieved by Apelles when finishing off his paintings with a thinly spread dark coating or “varnish”. How could we be sure when stripping off “varnishes” today, he asked, that no Renaissance masters had applied toned varnishes to their own works in emulation of antiquity’s fabled painter? He received silence. Gombrich returned play in a 1962 Burlington Magazine article (“Dark varnishes: Variations on a Theme from Pliny”). The discovery of a single instance of a tinted overall varnish, he suggested, would undermine the dogmatic philosophy of the National Gallery’s restorers. A dual reply came from the gallery’s “heavy mob” – its head of science, Joyce Plesters (who was married to the restorer Norman Brommelle), and the pugnacious former trustee and collector, Denis Mahon, in two further Burlington articles. Plesters herself dismissed Gombrich on two fronts: for lacking “technical knowledge” and for displaying incomplete and misinterpreted scholarship. The entire documented technical history of art, she claimed, showed that “no convincing case” could be made for a single artist ever having emulated Apelles’ legendary dark varnishes. The passage from Pliny, she sniffed, was merely a matter of “academic rather than practical importance”. She offered to “sift” and “throw light upon” any future historical material that Professor Gombrich might uncover – should he but present it directly to the National Gallery. Her technical rank-pulling was underwritten (as perhaps was her article in part) by the director, Sir Philip Hendy, who disparaged technically ignorant “university art historians” in the gallery’s annual report. In reality Plesters was a technical incompetent. It was she who claimed that the Raphael cartoons at the Victoria and Albert Museum were stuck onto “backing sheets” when there are none. It was she who described the large (150 cms wide) panel The Entombment, which is attributed to Michelangelo, as a single massive plank when it is comprised of three boards held by butterfly keys. It was she who counted six boards on the large panel Samson and Delilah, which is attributed to Rubens, when there are seven. Her errors were products of a then unchecked institutional culture of technical adventurism and gross aesthetic recklessness. Great Renaissance paintings were ironed onto boards of compressed paper (Sundeala board) which today are too unstable to be moved. 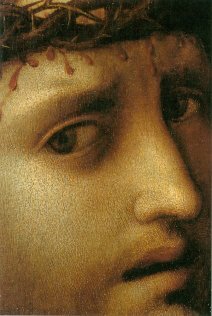 One such was Sebastiano del Piombo’s The Raising of Lazarus. That painting, originally on panel, had been transferred to canvas. When decision was made to re-attach the canvas to a Sundeala “panel”, technical examination identified three further “backing” canvases. When these three “backings” were duly removed it was discovered that no fourth and “original” canvas existed and that the surviving paint was attached only to a layer of disintegrating paper. But that crisis-of-their-own-making provided the gallery’s restorers with opportunity to play what Professor Thomas Molnar here called “demiurge” and improve upon the artistic content of the painting. In order to stabilise the paint layer which they had left loose and unprotected, the restorers embedded it from behind with terylene fabric attached by lashings of warm, dilute wax-resin cement. Because Sebastiano had painted his picture on a warm-coloured ground and because paint becomes more translucent with age and allows the tone of the ground greater influence on the picture’s values, the restorers decided to brighten things up and give the picture a brilliant white ground (like that of a Pre-Raphaelite painting) by adding highly reflective pigments to their own remedial wax-resin cement applications. Plesters died in August 1996. Earlier that year, the National Gallery had published a report in its Technical Bulletin on the cleaning of two paintings by a Leonardo follower, Giampietrino. One, his Salome, had clearly suffered the Gallery’s trademark restoration losses of modelled form (see right and below), but his Christ Carrying the Cross was miraculously unscathed. Moreover, that picture was found simultaneously to display an “intensity of colour” and a restrained “overall effect” – precisely the paradoxical combination attributed by Pliny to Apelles but that had been pronounced technically preposterous by Ruhemann, Plesters, Mahon, Hendy et al. 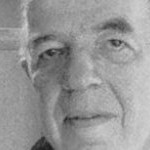 Gombrich’s vindication proved a double one. Not only had the gallery discovered a technical/physical corroboration of the scholar’s astute original supposition, but the survival of a Renaissance artist’s final toned coating served further to corroborate Gombrich’s general criticisms of the gallery’s over-zealous picture cleanings. Because the two Giampietrino works were restored at the same time in the same gallery, but with the surface of the one being protected from solvent action by an ancient oil-film, while that of the other was unprotected, an unwitting laboratory experiment had been conducted on the gallery’s own “cleanings”. We can now compare the appearance of the restored but protected painting, with that of the restored but unprotected one (see right and Michael Daley, “The Lost Art of Picture Conservation”, The Art Review, September, 1999). As can be seen here, the unprotected painting (the Salome) suffered clear and dramatic losses of modelling and weakening of forms. For a number of years after the twin Giampietrino restorations, it was possible to examine the two cleaned specimens side by side and to demonstrate the unequal effects of the treatments they had received. That is no longer possible. One of the pair has been relegated to the ill-lit basement of the reserve collection which is accessible to the public for only a few hours a week on Wednesday afternoons. The relegated work is not the restoration-injured Salome, but the miraculously preserved Christ, the very picture which now arguably constitutes the best-preserved example of a Renaissance artist’s technique in the entire collection. This picture, which might be expected to enjoy pride of place in the main galleries, shares its new dungeon exile with another recent National Gallery Embarrassment – the Beccafumi panel painting Marcia which was dropped and smashed at the Gallery when being “de-installed” from a temporary exhibition. We had hoped and suggested that the Christ might make a return to daylight on the occasion of the Gallery’s forthcoming Leonardo blockbuster exhibition, but it seems that it will not do so – not even to join Giampietrino’s full-sized faithful copy of Leonardo’s Last Supper. (For many years, that Giampietrino mouldered in the Royal Academy’s basement as embarrassing relic of the institution’s former artistic interests.) When the last restoration of Leonardo’s Last Supper got into difficulties, the copy was taken to Milan so that full-size tracings of Leonardo’s figures might establish the limits of the restorer’s own substantial watercolour in-painting. 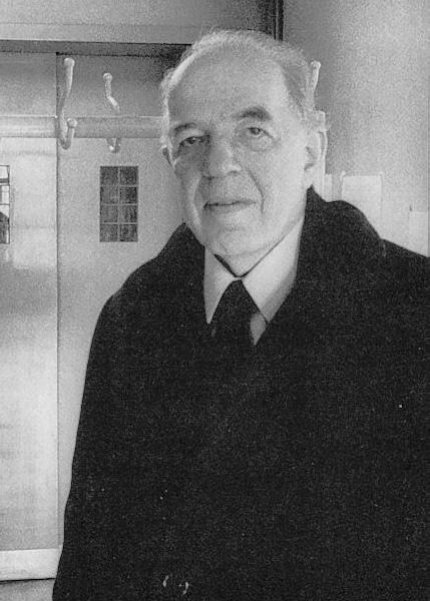 Sir Ernst (Hans Josef) Gombrich OM, CBE. 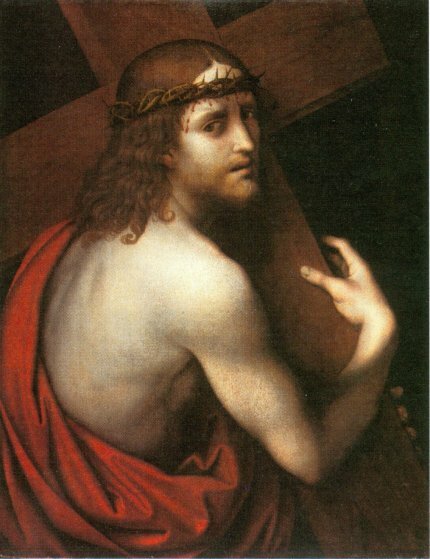 Above, Giampietrino, Christ carrying his Cross (NG 3097), c. 1510-30, Poplar, 59.7 X 47 cm. 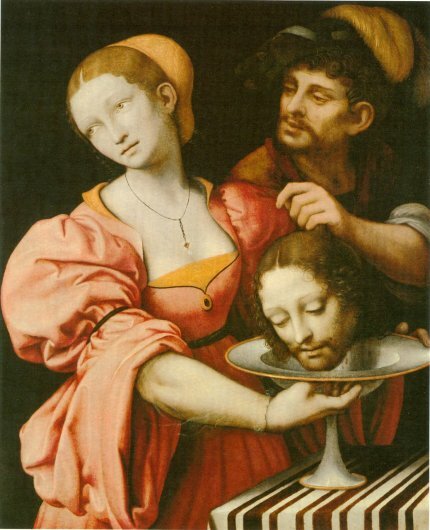 Below, Giampietrino, Salome (NG 3930), c. 1510-30. Poplar, 68.6 X 57.2 cm. 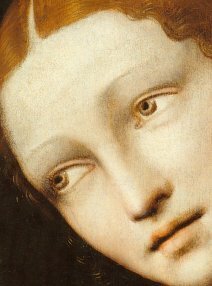 Above, Giampietrino, Crist carrying his Cross, detail. 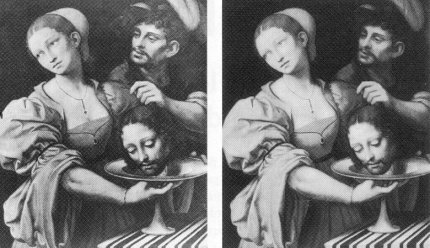 Below, Giampietrino’s Salome, before cleaning (left), after cleaning (right). Note the equalization of the shading tone on the drapery over the arm to the left that is seen in the cleaned state of the picture on the right. Note also, the weakening of the shading and modelling on Salome’s head and the weakened necklace (as was also seen in the Vermeer portrait of a girl in the post of January 23rd). The black and white photographs above and below constitute proofs of artistic injury. This can be said with confidence for two reasons. The extent and the progressively graduated manner of tonal variations seen along the successive folds of the drapery (before cleaning) are manifestly aristically informed and plastically purposive. It is inconceivable that accumulations of what restorers fondly call “filth”, or the natural discolorations of an ageing varnish film, could produce so skillfully orchestrated and enhancing complement to the linear design of the drapery. Artistically “formal” considerations apart, those – now gravely weakened – tonal gradations formerly served clear “theatrical”, symbolic and moral purposes. The light source within the picture falls from top left to bottom right. Salome, as if in shame or remorse, averting her eyes from her own dark deed, turned away from the Baptist’s severed head towards the light. The profiled side of her face, her neck and shoulder, and the drapery over her shoulder caught the light. The rest of the figure and drapery progressively descended into the central gloom of the painting. Such manipulations of contrasting values, which give expression to the principle player’s distressed ambivalance, are products of artistry and artistry alone. They are never fortuitous by-products of any natural disintegration of materials or accumulations of extraneous matter. Photographs by courtesy of the National Gallery. Click on the images above for larger versions. NOTE: zooming requires the Adobe Flash Plug-in.